I'm a firm believer that the idea of "one day" is the enemy of today. You know: "One day I'll write a novel. One day I'll visit Paris." The problem with that thinking is that there's rarely a perfect time in life to do anything. I'm all for carving out opportunities, regardless of how messy things get. I have very few regrets in life, but they all have to do with things I didn't do. Even when I've screwed up, I've found I'm better off for the experience. That's why in my Carpe Diem post last month, I fantasized about my many ideas for what to do with my part-time sabbatical that begins in August. My wide-ranging ideas were far too ambitious to fit into one year of part-time work. But how on earth could I choose? I took a step back and looked at what I'd been doing since moving to the Bay Area. From 2002 to 2005, I was immersed in art and design. Since finishing my graphic design program in December of 2005, I've been enjoying my work as a designer for my day job, but I use my free time primarily for writing and a bit of photography. I haven't done my own creatively directed art in the past five years. That's what I'm going to do with my year: My own art projects. No freelance work for clients; no trying to break into the professional world of book cover design; no selling photos through istock or Etsy. In other words: Nothing having to do with the business side of art. I've already got the username TheGargoyleGirl on Etsy, so if my projects evolve in the future then that's great, but that's for another time. This year is for my own creative exploration. I'll see where it takes me. 1. Keep a sketchbook. My sketchbook from school turned into a writing notebook. I want it all, so this year I'm buying a graph paper notebook for both drawing and writing. 2. Design book covers for books I love. To figure out if this is something I'd truly like to pursue, I'm going to do my own creatively directed study. I'm combining this idea with my earlier overly-ambitious idea of reading the entire John Dickson Car canon. I'll read as many of his books as I realistically can, and I'll design book covers for my favorites. 3. Step away from the computer and design by hand. The computer enables the creation of what you envision, but it can also limit what you imagine in the first place. I set up an art table in the garage last weekend, just like I'd planned to do when we moved into the house in 2009. Two years late is better than never! 4. Take art classes. I love workshops to jumpstart my creativity. Just like writing prompts have kicked off every short story I've written, art classes serve the same purpose. I've already registered for a workshop at the Richmond Art Center. 5. Step up work on my Gargoyle Girl photography. I'm nearly done sorting through my digital files, which was the easy part. It's time to dig into my box of negatives. 6. Write an experimental novel during NaNoWriMo. I'm thinking of trying out the idea I had for a steampunk mystery featuring an alchemist and her pet gargoyle. 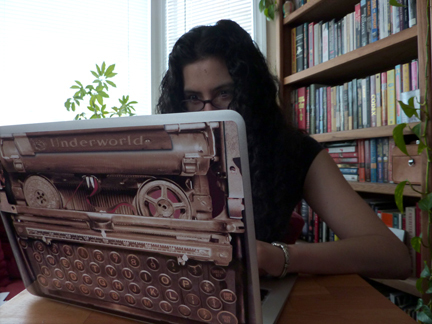 I think my beloved typewriter laptop skin is a sign I should give my steampunk mystery a chance. Thank you to everyone who weighed in both online and offline after my carpe diem post in which I contemplated what to pursue! Best of luck on what sounds like the best half-year ever!!!!! Congratulations on your sabbatical! Whoopee! I love the idea of a steampunk alchemist with a gargoyle sidekick! Happy to see some excitement for my new writing project, even though that's the one I would have done anyway ;). I'm thinking I'd like it to be a locked room mystery, so I'll need to get brainstorming -- plus I'll need some help from those of you who write paranormal! I like the steampunk with gargoyle, too. You have enough great gargoyle pictures to do the cover! Good luck with you OWN projects, and with NaNo. Very cool, Gigi! Here's hoping...no...here's KNOWING you'll be successful. Like you said, you'll be better for the experience. Just thinking about the blank canvas of time and possibility is inspiring. Let your imagination run and see where it takes you!